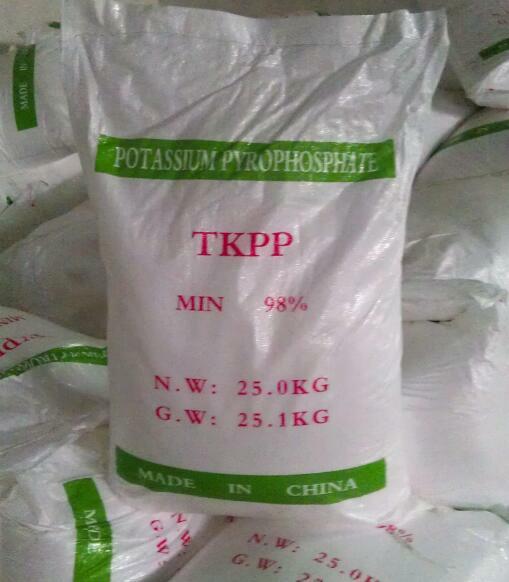 Characteristics: Potassium pyrophosphate, also known as pyrophosphate, 4 K, a white powder or solid block. The relative density of 2.534. Melting point 1109°C. Soluble in water, solubility 187g/100g water (25°C). Alkaline aqueous solution, 1% aqueous solution of pH = 10.2. Insoluble in ethanol. The properties are similar to other polyphosphates. Uses: mainly used for cyanide-free plating complexing agent for metal surface cleaning agent, dye, dispersant and buffer. Packing: Plastic knit bag , Net weight 25kgs/bag or 50kgs/bag . Storage in ventilated and dry plplace.